To make the chipotle béchamel: In a small saucepan set over medium heat, melt the butter. Once it begins to bubble, incorporate the flour. Cook for a couple of minutes, stirring constantly, until it turns into a paste and begins to smell toasty, and the color begins to turn amber. Add the cold milk and continue cooking, stirring occasionally, until the sauce thickens, another 2 to 3 minutes. Add the Dijon, chipotles in adobo, salt, and pepper to taste, and mix well. Once it has reached the desired thickness, about the consistency of a pudding, turn off the heat and set aside. Pre-heat the oven to 375 degrees Fahrenheit. Butter a baking sheet. Place the slices of bread on the baking sheet and spread a couple tablespoons of the chipotle béchamel onto 4 slices. Put a couple slices of ham onto each of the other 4 slices of bread. Top all 8 slices of bread with cheese, splitting about 1/3 cup of shredded cheese per sandwich. Place in the oven and bake until bread is toasty and cheese is melted, about 5 to 6 minutes. Meanwhile, set small skillet over low heat. Once hot, add a few drops of oil. Once the oil is hot, 2 at a time, crack the eggs into the skillet and season with salt and pepper. Cover with a lid and cook until desired doneness. I do about 4 minutes for sunny side up eggs with runny yolks and set egg whites. Remove the sandwiches from oven, close the sandwiches and put a pair of sunny side up eggs on top. 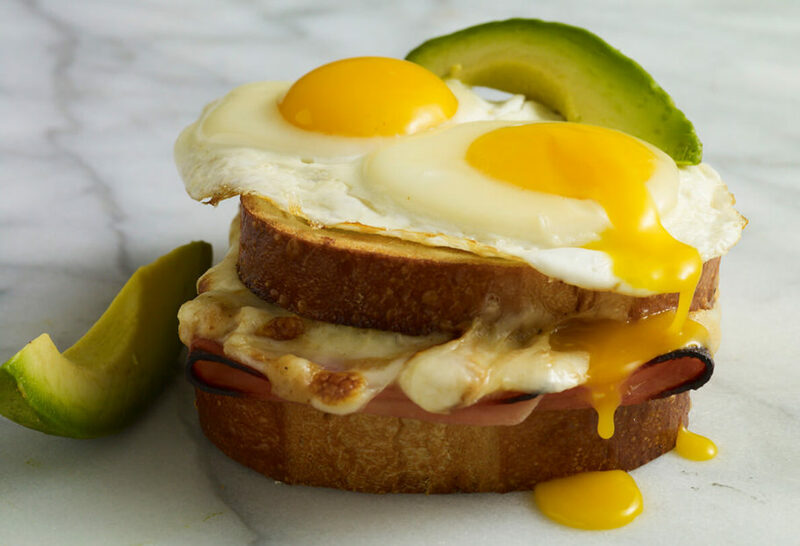 This sandwich kind of reminds me of this French Croque Monseiur sandwich (And the Croque Madame too actually, since I make my mom’s with a fried egg on top) I once made, but with a Mexican update, and it crazily has almost the same ingredients! But considering we’re both crazy for Oaxaca cheese (and I’ve started liking more spicy things 😉 ), I feel like now trying this version out. I have two questions, though. If you prefer not to use the peppers themselves but want a similar flavor, could you use chipotle powder (If so, how much?)? And then, I personally love a really cheesy bechamel. So can you melt some of the Oaxaca cheese into the sauce while using the rest on the sandwich itself? Go for it, Carlos! An extra cheesy sauce sounds yum. For the chipotles, I do recommend you use chipotles in adobo, as the adobo sauce has a delicious flavor. Just a note to let you know that my now 7 year old granddaughter and I watch the shows and prepare meals from it. This one of her favorites, Senor JuJu (she loves the name and his appearance). She sings the intro song for the selected segments. She decides which recipies to try by the number of times you Paty say “hmm” when testing it at the end of the show. She requires at least 3 “humm, hm, hum, hum.” 4 at preferred. Gracias a ud Paty y a su equipo. Too adorable! Thank you for sharing Raquel, and say hi to your granddaughter for me! Oh I’m so glad you enjoyed the sandwich, Cathy! And bacon is always a yum substitute 😉 Have a very Happy 2019! Made this this AM and wow this was great!! Thank you. I’m glad you had a yum breakfast, Steve. This one aired again today in Santa Fe. My fiance will love this sandwich this weekend. He discovered southwestern and Mexican food after moving here a couple years ago. Thank you! Oh enjoy the weekend, Donna, and I hope your fiance and you love the sandwich! What a blessing to discover a TV cooking show that is relaxed yet intelligent. The warmth of the interactions of both family and guests just adds immeasurably to the warmth of the delicious food. I thank you and so does my family! Oh thank you so much Mrs. Cuello! If I can’t find those two cheese, what else can I use on the sandwich. Hola Pati! Could you please tell me the brand name of the small non stick orange skillet with the lid that you used to cook the eggs in this episode? My wife has seen you use this pan in two episodes and she is going crazy trying to find that exact pan in stores. I’d like to surprise her with it. Thank you! Oh those were a gift…so not sure. I found it! By pausing a recorded episode (huevos rancheros con calabacitas) just at the right time, I was able to see the brand name on the lid, and I found them online, in case anyone else is interested. It is the IMUSA 6 inch mini casserole egg pan. Awesome Chris! Thanks for sharing. I made it this Morning and we loved it, next time I will put more sauce on the Bread! I made this sandwich about an hour ago. It was wonderful. I wanted to also encourage you to continue in your work. I love how you are teaching me to manipulate the sauces I know, in ways I’d never thought of before, and how you opened me to a variety of different flavors of rice, and the technique used to to accomplish authentic Mexican Cuisine. Much love to you, and your family. Oh thank you so much for this lovely comment, Daniel! ​Oh that is a small non stick skillet with a lid, they sell them in many stores!